Lit Beat is back in action! It’s wonderful to have had a bit of the summer to relax, refresh, and explore new ideas. Wishing you an upcoming school year filled with promise. I hope this post sparks your thinking. Please post a comment to share additional connections or implementation ideas. We look forward to hearing from you! The diversity present in our classrooms requires us to think differently about the literacy instruction we offer our students. We need to offer new opportunities for students learning English to enhance and extend their language, literacy, and content learning. This new post suggest ways to (1) use digital videos and animations to promote students’ vocabulary development and content knowledge, (2) use bilingual texts to encourage language and content learning across the curriculum, and (3) involve students in sharing ideas with the aid of digital tools. ELLs benefit from a multi-faceted approach to learning that makes use of interactive visuals. The Internet offers easy access to a great many of these visuals across a range of topic areas. Providing students opportunities to view media that presents ideas both textually and visually creates a meaningful learning context that supports the acquisition of academic vocabulary in writing and speaking (Dalton & Grisham, 2011). Using digital resources brings concepts to life for students. Pairing them with opportunities to read, write, and share ideas helps support and enhance ELL’s content understanding. Children of all ages and backgrounds seek to better understand the fascinating animal species found in our world. The Monterey Bay Aquarium, home of several sea otters and other marine creatures, makes reading about animals an adventure. 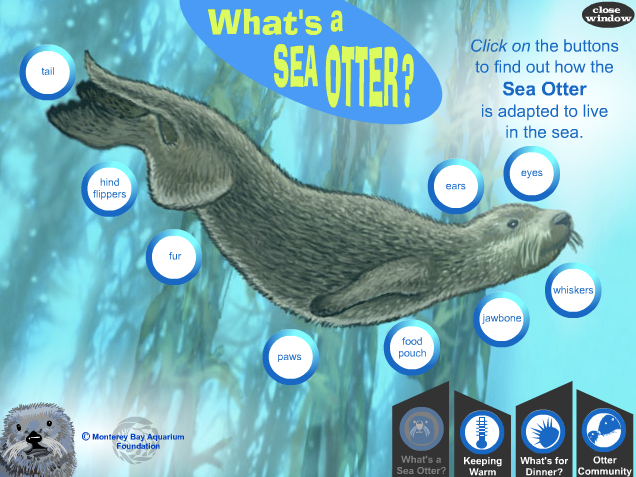 The Sea Otter Interactive http://www.montereybayaquarium.org/media/all_about_otters/whatsanotter01.html is one of many resources that will spark students’ curiosity about the natural world. The visual support offered by the animated otter, along with the illustrative diagrams and animations, provides visual support that aids students in making connections across languages. Providing opportunities for students to discuss the interactive in their native language before participating in whole-class discussion can reinforce these connections. The native language discussion serves as a form of language rehearsal where students can organize their thinking, plan, test their ideas, and make appropriate revisions before sharing their thoughts with the whole class. Discussion techniques such as Turn and Talk or Think-Pair-Share are some examples of ways to provide opportunities for language rehearsal. When introducing a new interactive to your class, set up a digital projector and talk through one part of the resource as a demonstration while generating guiding questions together as a class. Then, offer students time to explore the digital resource in small groups during literacy center time. This second self-guided viewing will provide a means to read for a purpose, investigate the questions posed, and deepen students’ interest. To locate additional resources in curriculum areas you teach, search Google by typing in your topic area + interactive (e.g. solar system + interactive). Effective literacy instruction makes connections to students’ linguistic, literacy, and cultural resources. These resources can be used to support learning in their second language. Utilizing educational resources in both languages builds students’ cognitive flexibility and increases meta-linguistic awareness (Gort, 2008). 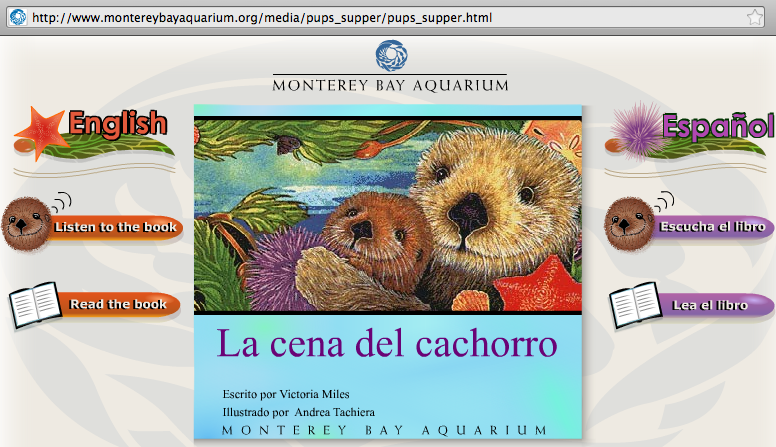 Bilingual websites such as Monterrey Bay Aquarium’s Pup’s Supper/La Cena del Cachorro http://www.montereybayaquarium.org/lc/activities/book_pups_supper.asp encourage home school connections and encourage learning across the curriculum. NASA’s Sun-Earth Day Multimedia Children’s Books http://sunearthday.nasa.gov/2006/multimedia/books.php are free animated multimedia books that present concepts both visually and textually. Because these resources make it possible to see and experience phenomena such as aurora, they support the development of language, literacy, and content simultaneously. Accessible in both English and Spanish, each book poses essential questions and presents concepts that help students address them. Related resources such as an image gallery and dictionary, extend ideas presented in the text. The Rainforest Alliance Virtual Story Books http://www.rainforest-alliance.org/kids/stories offer engaging and colorful fiction and non-fiction books in three languages English, Spanish, and Portuguese. These texts engage young readers by introducing them to children who live in areas that surround rainforests. The imagery and first hand accounts captured in these unique texts make students more aware of these diverse environments and the wildlife that inhabit them. Exploring these engaging texts extends emergent bilingual students’ comprehension and vocabulary while helping them make connections between languages. The International Digital Children’s Library http://en.childrenslibrary.org/ is a portal site that makes children’s books from around the world available in a variety of languages. Over 2,800 books are available in 48 languages, free of charge. The simple search feature makes it easy to find books that match the age range and interest level of all students. Each text includes a feature that allows the reader to switch the language for instant translation. Because the books on this website do not require a trip to the library, students can access them at school and at home. The Internet has made it possible to write in a variety of forms and reach a wide audience almost instantaneously. By introducing new outlets for sharing ideas, ELLs can make important connections between reading and writing. Wordle http://www.wordle.net/ is a resource that makes it possible for students to generate word pictures using an assortment of words that they chose (in any language). How frequently the inputted terms appear determines the size, placement, and prominence in the final product. The interface eliminates common words such as “the” or “and” so that key words take on greater emphasis. The selection of layout schemes can be used to highlight ideas and relationships among terms. This easy-to-use resource provides students a powerful tool for expressing their developing understanding of words, concepts, or ideas in a motivating and engaging way. For example, Wordle can be used to extend quick write activities. For example, after reflecting, students can be paired up in small groups to input their writing into the interface. Printing out students’ Wordles and creating a gallery walk can be a useful review and reflection activity to summarize what they have learned about a topic they’ve studied. Repetition of similar learning statements in this case would be beneficial since key concepts would pop visually and aid students in recalling important ideas. These alternatives for formal writing activities would also provide teachers a way to formatively assess students’ understanding of content studied. ELL students can create Wordles in their home language. Below is one that Iliana created to reflect the concepts she had learned about the sun and its importance the solar system. 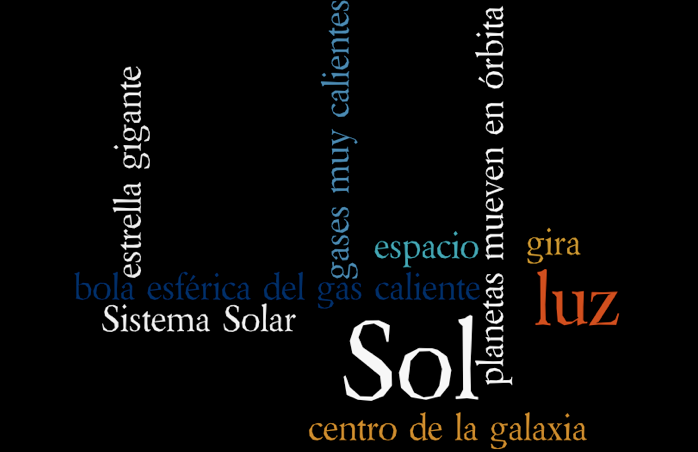 She placed a tilde ~ between words that she wanted displayed together, such as sistema~solar so that these terms would appear side by side. RealeWriter (“Really Writer”) http://www.realewriter.com/ is a free Web site that invites users to upload images or drawings, write their own text, and publish professional looking books that can be printed or posted online. Educators have used RealeWriter to author books collaboratively as a class project and also as a tool for individual student authors. Innovative educators all over the world have used these resources to help students express ideas. The ease of the software enriches the writing experience and helps English learners find their voice as writers. RealeWriter turns writing into an experience that is enjoyable, authentic, and social. To get started with RealeWriter, explore the wide selection of student published books. Topically focused texts can be found by typing key words into the site-specific search engine at the top of the page. Clicking on the featured or popular books tab to view examples that will appeal to all ages and interest levels. El Mercado is a delightful Spanish/English bilingual book that takes readers on a trip through a market place in Mexico City in search of a birthday present for six-year-old Sean. As new technologies continually emerge, new skills and strategies will be required by students to effectively make use of them. Though many teachers have yet to possess these skills themselves, it is nonetheless our responsibility as educators to provide an educational context in which all students can acquire them. Extending these digital learning opportunities is central to students becoming participatory citizens and achieving success in school, higher education, and the workplace. Dalton, B. & Grisham, D. (2011). eVoc strategies: A dozen ways to use technology to build vocabulary. The Reading Teacher, 64, 306–317. Gort, M. (2008). “You give me idea!”: Collaborative strides toward bilingualism and biliteracy in a two-way partial immersion program. Multicultural Perspectives, 10(4), 192-200. Jill, these are really excellent interactives and simulations. Putting language and digital technology together is a match made in pedagogical heaven!